It’s almost 3 weeks since I wrote a post myself. All thanks to my guest posters whose posts helped in keeping DailyBlogging up and running with constant traffic. It’s a common knowledge that good posts attract good comments. So if you remember, a few months ago we had introduced Banner Slots as the Top Commentators Award. We gave the Top 2 Commentators a chance to advertise their blog on our sidebar in the form of a 125*125 banner slot. But lately I noticed that by the end of the month there is always a rush of comments by few commentators to reach the top 2 spots. A few of DailyBlogging’s readers also noticed the same and sent me their reactions and observations. Most of their views included a point i.e. to remove the ‘Top 10 Commentators’ widget completely. My point is that, by removing the widget completely we would definitely achieve our goal but it would annoy our good commentators who comment to the point and not just look out for back linking opportunities. So, finally I decided that we would be giving two banner slots to those two commentators which are chosen by a random process. Certainly those two commentators won’t be chosen by me; but by random.org. The Top Commentators Widget would remain as it is. That widget will help me in putting all the 10 commentators into random.org and then select the two randomly by using the List Randomizer feature. This process of Random selection of two commentators will start right from this month i.e. 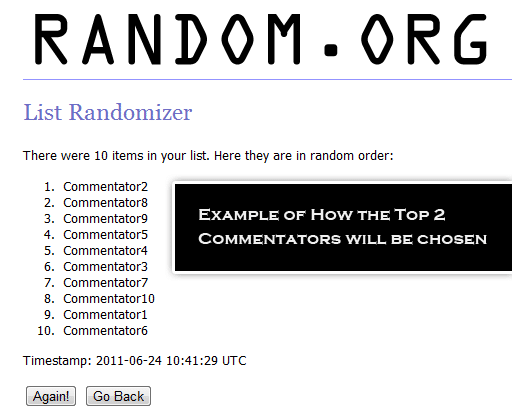 the Top Commentators Award for June 2011 will also be given by the random process only. I know commentators who are already in the top 3 positions in the Top Commentators Widget (currently) would be unhappy with this move, but they need to understand that this move was very necessary and hence it is taken at the moment. I would also like to clarify why I posted this today because people would ask me, why I didn’t inform them earlier. The reason for that is, my exams were on and they continued till the 20th. So, I hardly got any time to write a post on this issue. Hope you’ll take it in a positive sense and help towards making DailyBlogging a better community in the blogosphere. If you have some innovative ideas to decide the Top 2 Commentators then you can always drop a comment below. Too good to hear, Hopefully I might be the lucky one! Ok Got your points, but this time I was supposed to be the top commentator. Well as I said, the Top 3 might be disappointed, but I gave valid reasons for the change and time of posting it. Also, how are you so sure that you were supposed to be the Top Commentator ? They are 5-6 days still left for the month to end. Great idea and way to make your readers and those that interact even more interactive and get everyone involved. I might have to go this route, I like it. Oh, this looks like a really good move, as it will give even chance to all good commentators to be featured on your blog! Good stuff… just hope I can win this time! Well that’s a FAIR and SMART move Mani!!!! Great… That’s a good move mani!!! Always like a blogger that can change and give new ideas a try. In order to study the characteristics of a random process, let us look at some of the basic properties and operations of a random process. Below we will focus on the operations of the random signals that compose our random processes. Why not, it can stop the silly comments at the end of the month and instead get more quality comments over the whole months. This will the great and stop fighting among your commentators to be the top commentator to get the ad space on your site . This is actually good to select the commentor on randomly and in this way each one of your regular and loyal commentor get a chance to win.